Total length (top of waistband to bottom leg opening) - 40.25in. Waist, laid flat straight across - 17.25. Cuff, laid flat straight across - 7.5in. Sleeve (collar to cuff) : 28.5". Waist: 15". Outseam: 20". Inseam: 11". Lightweight; 4-way stretch. AQUA LIGHT GREEN - CHARCOAL COLLAR- SIZE LARGE. STYLE: "athletica" FIT POLO. SHORT SLEEVES. UNIQUE SOFT POLY-STRETCH BLENDS. MATERIAL: "SELF"- 37% POLYESTER, 51% NYLON, 8% SPANDEX & 4% X-Static Silver Nylon. When dress Shirts are S, M, L, XL, etc. Small mark on sleeve (See picture). Outside of that very good condition. Waist: 32" in. Inseam: 32" in. Fair condition, small stains on both legs. Preowned very good condition. Shirt shows very light signs of wear. No holes, pulls, or stains. See photos for details and measurements. Lululemon Men Shirt Sz Large Long Sleeve Blue Front Pocket Cotton. Condition is Pre-owned. Shipped with USPS First Class Package. Charcoal gray. Waist laid flat is 17 in. 6-7/10 condition minor fading and wear. Men’s Green Lululemon Long Sleeved Shirt XXL. Condition is Pre-owned. Shipped with USPS Priority Mail. 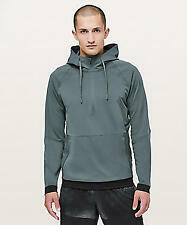 Dark Grey Heather Lululemon City Sweat Hoodie Xl Mens. Shipped with USPS Priority Mail. These pants are in excellent condition. I have also photographed the reflective strip that is revealed if you roll up the pants. make Supersized seem small. Get images that. 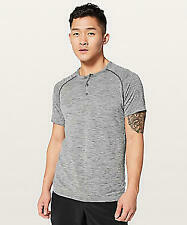 Item: Lululemon Gray Nylon Blend Casual Tech Polo Shirt. Material: No Material Blend But Feels Like a Nylon Blend. Size: No Size But Fits Like a XL. Lululemon ABC Pants Size 34 Gray. Condition is Pre-owned. Shipped with USPS Priority Mail. Men’s Lululemon Athletica Shorts Size 32 Gray. Good Condition is Pre-owned. Please check all photos ! Shipped with USPS First Class Package (2 to 3 business days). LULULEMON COMMISSION PANTS. Commission pants. 27.5" inseam. Color: Olive. Great condition. (is black even tho it looks more gray in the pictures). MEN'S LULULEMON CASUAL FLAT FRONT GOLF PANTS SIZE 34" X 30"
PERFECT FOR GOLF. SIZE 34" WAIST AND 30" INSEAM. TWO REAR POCKETS. SUPER COMFORTABLE AND EASY TO MOVE AROUND IN. Lululemon Button Down Shirt. Long sleeve button down shirt. Gray Pinstripe Running Shorts. Condition is excellent pre-owned. Item: Lululemon Blue Striped Casual Tech Golf Polo Shirt. Size: No Size But Fits Like a Large. Lululemon Mens Lightweight 3/4 Zip Hoodie Dark Gray Size XL. In good condition showing little wear, no holes, rips or stains. Measures 22" arm pit to arm pit, 28" collar to hem and 33" sleeve from collar. Two way stretch Qwick Oxford fabric is sweat-wicking and quick-drying with added LYCRA® fibre for stretch and shape retention. Don't sweat it! this classic, sweat wicking shirt takes you from work week to weekend. Tapered leg, slim fit, elastic cuff. very nice pants in excellent condition, barely worn. COLOR: gray. 15" across waist. Lululemon Mens ABC Pant Classic 34" Grey. Condition is Pre-owned. Shipped with USPS First Class Package. It is made of high-stretch Vitasea™ fabric with high LYCRA® fibre content which gives this top great recovery and shape retention. LULULEMON Men’s short sleeve performance Polo shirt Size XL - no tag, see size dot Brick red in color with pin striped horizontal stripes in gray 4 button front placket Breathable Signature reflective LULU logo on the back of neck Excellent used condition! No rips, stains or tears. Great shirt!! Please see pictures of measurements for sizing prior to purchasing. Thanks! Lululemon Mens Shorts Size 34. Condition is Pre-owned. Shipped with USPS First Class Package. Condition: Good used condition with no major sign of wear such as wash wear, fade, stains, pulls and holes. Length (Top of Collar to Hem): 29. Pit to Pit (Across Chest): 21. As shown in photos. They are a few years old. Good luck! Four-way stretch fabric. Drawcord for a customized fit. 9" inseam. Designed for to from. 69% Tencel lyocell, 27% nylon, 4% elastane. Front zipper closure. Features two front pockets and two on the back. Not lined. 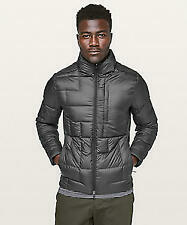 Lightweight, water-repellent and wind resistant. Color: black. The Lululemon company carries a variety of yoga-inspired athletic apparel. Men can find many types of athletic wear that they can wear in a variety of situations, whether they're heading out to the gym or going out for a run. Lululemon clothes are versatile, and some can be worn as loungewear around the home. What types of Lululemon tops are available? The 5-Year Basic Tee: A go-to crew shirt is what a man might need in his wardrobe. This Lululemon one is made with Vitasea fabric, which is soft and durable. The Metal Vent Tech Surge Tank: Warm days call for cool clothing, like this breathable, seamless Lululemon tank with an integrated open-hole mesh fabric. The Evolution Polo: This shirt incorporates Silverescent technology, which can help prevent odors. The All Town Buttondown: With a collar and buttons down the front, this shirt can be appropriate for any situation that calls for a little more formality. The Sojourn Jacket: As a track jacket, it has multiple zippered pockets so you don't lose your keys or wallet. It's also comfortable enough to run in and is made with Warpstreme fabric. What types of bottoms does Lululemon sell? Pace Breaker Short: With large pockets, these let you carry what you need while you are out and about. These Lululemon shorts are functional and comfortable enough to wear all day. T.H.E. Short Linerless: These shorts are made with different length inseams so you can choose something that works for you. The Swift Ultra fabric has a four-way stretch. In Mind Pant: This pant is lightweight and stretchy so you can bend and flow without a worry. The fabric is sweat-wicking and quick-drying. Intent Jogger: Their Luon fabric makes them extremely soft while still being able to wick away sweat. Are there accessories for men available? The Lululemon company makes several accessories that men can choose from. The following accessories are ideal for the yoga studio and the gym. Purist Team Bottle: This squeezable water bottle made by the Lululemon brand can carry 32 ounces. Reversible Mat, Expression: This mat measures 5mm thick and has extra cushion in the midsection to support hips and knees. Namastay Mat: With Luvea rubber, this mat provides cushion and has extra grip at the ends to keep you in place. The rubber is natural and sustainable-sourced. Loop It Up Mat Strap: You can use this strap to effectively wrap up your mat and carry it around easily. Content provided for informational purposes only. eBay is not affiliated with or endorsed by Lululemon.